Some other small potatoes are actually immature babies, harvested long before they are able to develop into fully mature, nutritious, and tasty potatoes. That’s why they’re sometimes called “baby potatoes.” Not our Creamers. Our Little potatoes are fully mature Creamer potatoes. The smallest in the potato family, our Creamers are specifically bred to be small—19 to 41 mm only. This premium, bite-sized package is what sets us apart. Harvested only when they are at their peak of maturity, their nutrient-rich skins and buttery taste are second to none. Our Little potatoes are “the right size” every time. We make the extra effort to triple-sort our Creamers. This ensures they are all consistently the “right size,” so that every Creamer in the bag cooks to the same “doneness”—not too much or too little. Creamers are so easy and quick to prepare, and, you only get grade 1 potatoes—the best—not seconds or grade 2s (off-grades). These bite-sized nuggets have soft skins and naturally creamy flesh—no peeling required. Loaded with all kinds of vitamins and minerals, they’re actually at their nutritious and delicious best with the skins on. Try these Creamer recipes we love. Toss them in a soup or stew, roast them up quickly, microwave, or boil in minutes—even on a busy weeknight you can enjoy some perfectly delicious and good-for-you Creamer potatoes in the time it takes you to make a salad and set the table! We offer a wide range of fun and tasty Creamer varietals to add color, flavor and nutrition to your plate. Perfect for a busy weeknight—our Creamer potatoes with sausage and red pepper cooks up in 30 minutes and it’s always a big hit. 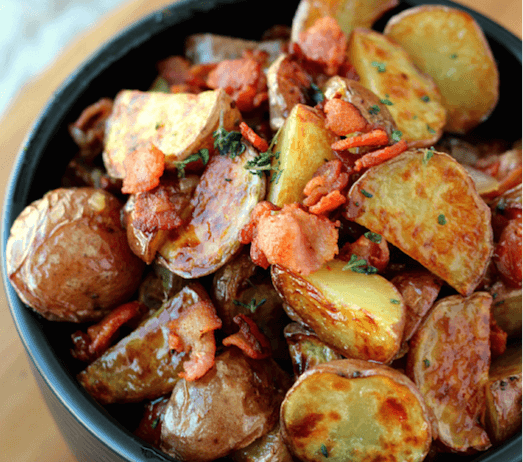 Not your typical potato salad, here’s a delicious recipe twist you’ll love! Warm Creamer potato salad with maple and bacon.